I never thought I’d be able to climb this mountain that soon. I always thought that the town where it is located is difficult to get to. But while I was following my Leyte 360 itinerary, I realized that it was easier to access than the most popular mountain in Leyte (Alto Peak). Mt Cabalian is conveniently accessible via San Juan (formerly Cabali-an). A beautiful lake (Lake Danao) sits on its peaks. This lake is the primary objective for a climb in Mt Cabali-an. And this should carefully not be confused with Lake Danao in Ormoc. San Juan can be reached by taking any bus or van from Tacloban, Sogod, Liloan or Maasin. The first thing in San Juan that surprised me was that they sell butane gas there in refilled canisters! Then you’ll notice that every block there has a bakeshop! And finally you won’t fail to notice how nice and kind the people there are! These people will tell you how to get to Lake Danao. When climbing Mt Cabali-an, the first thing you should do is log in either at the municipal hall or at the PNP station (the latter is better). Then ask for the way to Lake Danao. They’ll point you to the turnoff at the highway where you’ll be following the access road to the PNOC drill site. This access road is about 8km in length. A hundred meters before the drill site you’ll see a trail that veers to the right. You’ll follow this 3km trail until you reach Lake Danao nestled in the midst of Mt Cabalian’s peaks. I initially planned to camp overnight at the lake by myself but I missed the trail that veers to the right so I ended up at the PNOC drill site. There, I met two security guards who talked me out of camping at the lake alone. They gave me a lot of reasons not to. They told me to just camp around their compound so I did. Upon reaching the PNOC site, I thought it was a good idea to have a drink in the evening, so one of the guards took me back down the mountain on his motorcycle and we bought some lechon manok and a bottle of Emperador Light . I spent the evening sharing stories with the guards over a bottle of Emperador Light and lechon manok. The following morning, I left some of my stuff at the drill site and just brought my hammock, camera, pocket book, packed lunch and fishing rod. When I reached Lake Danao, there were already four teenagers and one adult there who had camped the night before. I climbed down in the afternoon and stayed at Tops Lodge in San Juan. It was one of the best climbs I had in years! It starts with the people there. They remind me of the people of Benguet. They are nice and kind. The only difference is that the people in Southern Leyte are warmer! They’ll approach you not because they are interested in getting anything from you but because they always feel that they always have some help to offer. I asked for the PNOC access road from a woman and she got out of her store to point me to it. I asked where I could possibly buy butane gas and the folks gave me more details than I needed. When I asked how much the suman cost, the salesman said ‘Trece ra ba sir!’ (with the ra ba that indicates concern and caution). No salesman would say this except when he really wants to make sure that the customer gets good value for his money! From the people, you have the place as your second reason to visit or revisit Mt Cabali-an. The place is just a few minutes away from St Bernard (the site of the infamous 2006 Guinsaugon Mudslide). I wanted to see the site of the mudslide just for history’s sake. But when I saw the mountain that killed more than a thousand people in 2006, I thought to myself, ‘If this were close to Manila, this could rival Mt Batulao and Pico de Loro in terms of number of visitors.’ The jagged peaks resemble the saw-tooth like Mt Guiting-guiting in Romblon. Furthermore, the place is easily accessible without the need for a guide. The PNOC access road is very clear and the trail to the lake has a few forks. You won’t get lost. The trail is clean and covered in the canopy of rain forest trees. Although you might slip and fall if your eyes get busy looking at the wild anthuriums scattered along the trail and the birds flying from tree to tree. The mountain is uninhabited so you won’t see a lot of trash and you won’t smell the stench of pigsties and unsealed outhouses which you will normally experience in most mountains in the country. The trail is intact and will definitely give you a very pleasant trek! At the end of the trail is the majestic Lake Danao. to give me a good reason to return, I left this fishing rod at the PNOC drill site. And that's what they shared among themselves for lunch. At Lake Danao, you can enjoy fishing and swimming while drinking its clean water! Unlike most lakes I’ve been to, its banks are not muddy and provide very good camp sites! What made my visit there memorable was the unfamiliar flora and fauna. I saw strange small frogs leaping (more like gliding in the air). The security personnel also warned me of wild boar and monkey that may attack people. On my way down, I also saw a couple of owl-like birds and an eagle flying from tree to tree. At the lake I picked up some acorns (I always thought I’d only see them in the northern hemisphere). I also saw and ate Catmon. I never thought that the town in Cebu and several barangays in the Visayas got their name from this sour fruit! It is a wonder why this mountain has not caught the attention of local climbers in Cebu and Leyte. I have previously advocated the Don’t Ask Don’t Tell travel dictum, but I really wanna help the tourism industry of Southern Leyte so I’m writing this. At the same time, this will give Visayan trekkers more climbing options in addition to Kanlaon, Talinis, Alto Peak and Osmena Peak. I told the tourism officials there that I might be back by April but I think I have to go back there before Christmas. The birds are being decimated by local hunters. Everyone there has a hunting rifle. Even the campers I came across with and the PNOC station guards have these rifles. So if you’re tired of issue-infested mountains, head for Mt Cabali-an. This is the mountain which made me put my book down and read instead the illustrated book that is Nature! four to five hours from the turnoff at the highway is a rough estimate. you should visit the place. it's beautiful! PS: Please don't avail of guiding services offered by some kids there. This might lead to a compulsory guide system in the place and/or hostility from locals if one refuses guide services someday. The way is very easy and clear! You won't get lost. This is actually known among climbers in Southern Leyte. This is a dormant volcano. Next time if you are around the area, check the hotsprings in Anahawan. You can also find the cleanest rivers in Silago. These places are just nearby. Hope it would not be the last time to visit the place. GODBLESS! it won't...Tops is one of the coziest and homiest places I've stayed at! I'd go back to San Juan even if I were not to climb Mt Cabalian...I just love your town! I wonder how's the safety / security in the area there nowadays. And if the place is still open and accessible to backpackers / visitors. I felt no NPA-related tension whatsoever when I climbed this mountain. Just log in at the police station in case there are pertinent updates. Went up the lake a week ago with fellow Cabalianons. 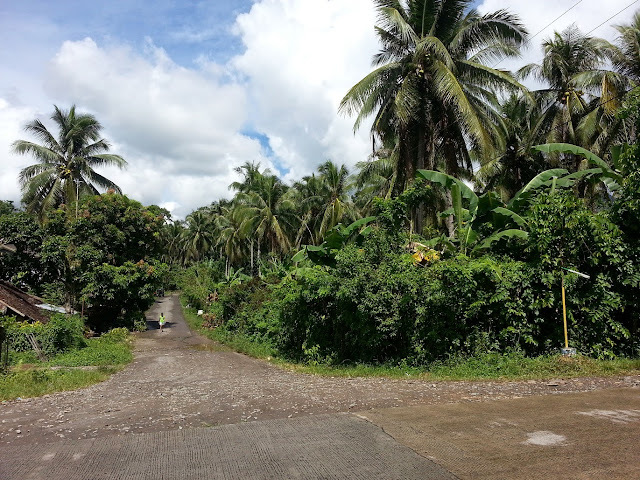 We took a different 'shortcut' route thru Brgy. San Roque. Climb was a bit of challenge due to rains but the summit was breath taking. Lake Danao is steadily gaining publicity these days.